A few months ago, the XDA community broke out in a great mood. I had managed to provide a DRM patch for the Sony Xperia XZ Premium. A short time later I developed XperiFIX, a software that could flash the needed files and install the patch. However, the matter had a catch. With each new firmware release, a modified kernel had to be deployed for the DRM patch to work. Also the procedure for the patching was quite impractical. So I decided to invest more time. Some things have changed with the new version of XperiFIX (v2.0 +). As of now, no pre-modified kernel is needed anymore because the software automatically patches the kernel’s existing ramdisk. In addition, the respective system files are automatically hacked. This paves the way to support many more devices. Updates to the software can be made much faster and the software does not need nearly as much disk space. 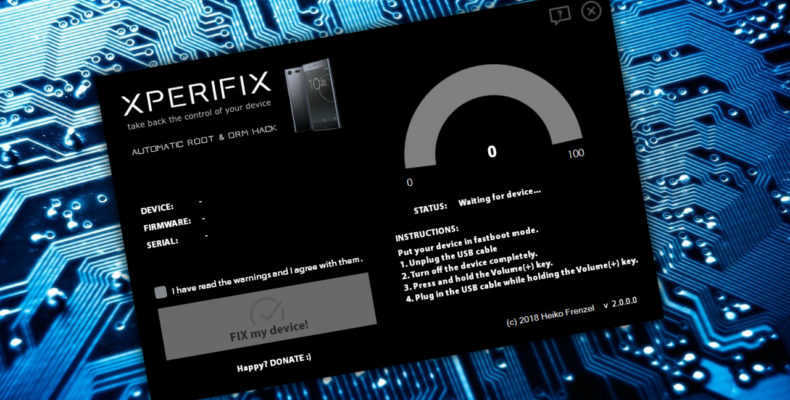 XperiFIX now fully automatically recognizes the device, its serial number, the exact model, the installed firmware and more. It chooses the appropriate files and prepares the procedure. So you can hack your device with one click and errors are largely avoided. Nice, huh? The older version (v1.4) can still be downloaded. This also supports older firmware versions of the Sony Xperia XZ Premium. Version 2.0 and above, will probably only support more recent firmware versions (Oreo). Other devices and firmware versions will be covered in future updates. So I try to help as many or even all users of the Sony Xperia devices to get their control back. If you want to support the project, you can do so with a donation. The opportunity to do so can be found on the website, at the bottom. Your’e the man storm !! nice job thank you ! Storm, I’m about to dive in….You should be commended for your efforts alone! If this works with no issues, I’m definitely going to donate. You are genius. I live in Poland and I can not buy and I can afford it!